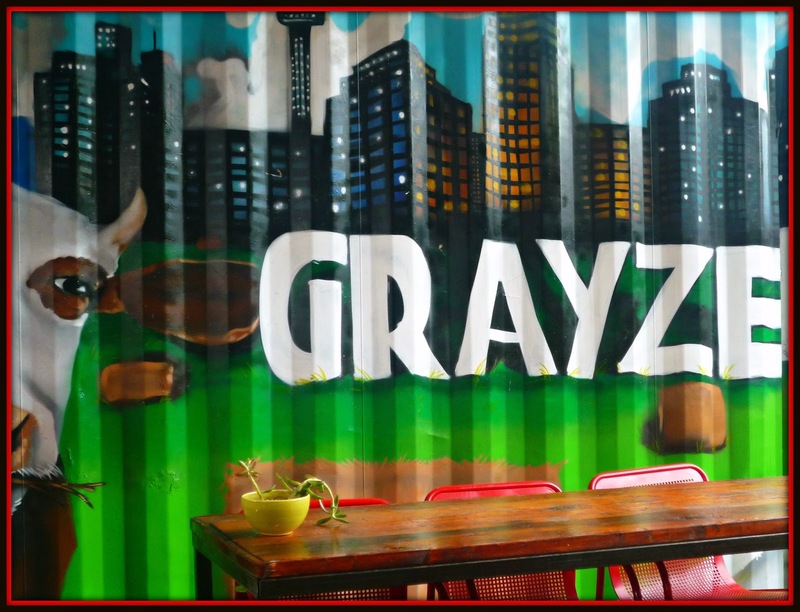 For this month's edition of The Weekend Gourmet Dines Out -- the last for 2016 -- I'm featuring Grayze. Grayze is located in a former home on Grayson St., not far from Downtown. 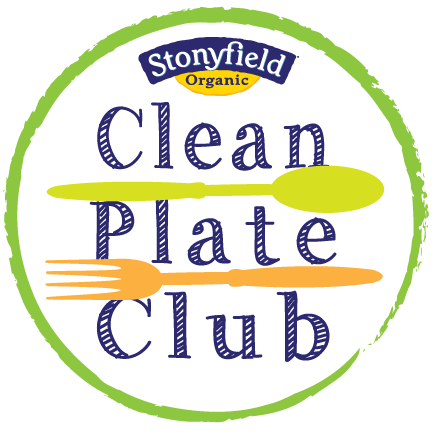 That location makes it convenient for both locals and visitors to visit this great restaurant! 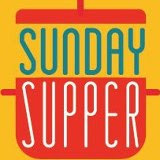 During the week, they offer creative lunch and dinner menus...but on Sunday, they offer a fun and creative brunch menu. If the weather is pretty, there's a large outdoor covered patio to dine on. When we visited Grayze for a very special brunch last month, it was a gorgeous Sunday morning...so we headed outdoors to dine al fresco! Over the next hour and a half, we enjoyed delicious casual gourmet menu items -- paired with amazing mimosas courtesy of Anna de Codorníu sparkling wine. Let's face it...the perfect mimosa is a key component of any weekend brunch experience! Throughout the Fall and holiday season, Anna de Codorníu teamed with restaurants throughout Texas -- including Grayze -- for spotlight brunch menus. Anna de Codorníu is Spain’s best selling sparkling wine. Elegant and feminine, Anna de Codorníu has a crisp, refreshing flavor that's pairs perfectly with classic brunch fare. With its striking white bottle, Anna is made in the "méthode traditionelle" from Chardonnay and Pinot Noir grapes sourced from Codorníu’s vineyards in D.O. Cava, in the greater Barcelona region of Spain. 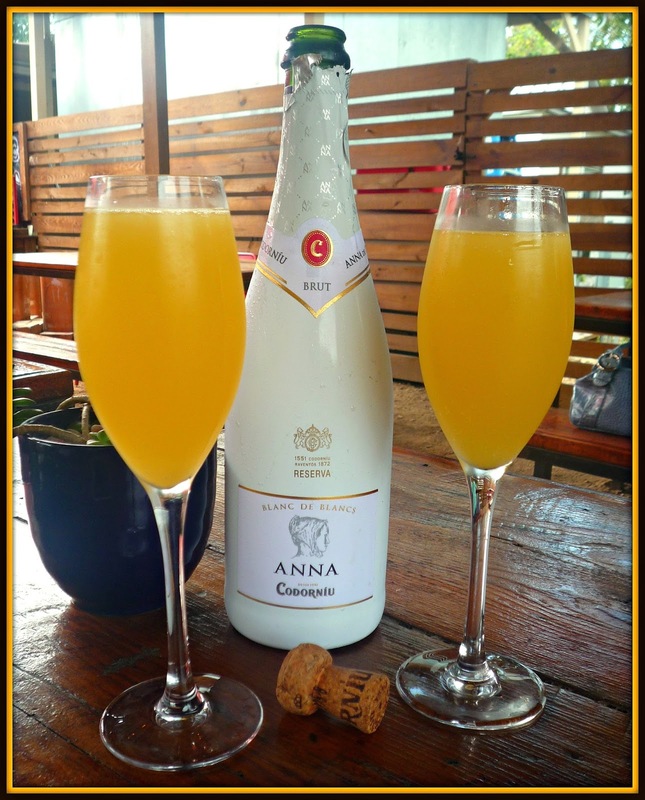 Anna is perfect for mimosas, with its delicate citrus flavor profile -- and a touch of creaminess that comes from 15 months of extended aging. As we sipped on delicious mimosas, we looked over the Grayze brunch menu. After mulling over our options, we decided on a quartet of menu items. 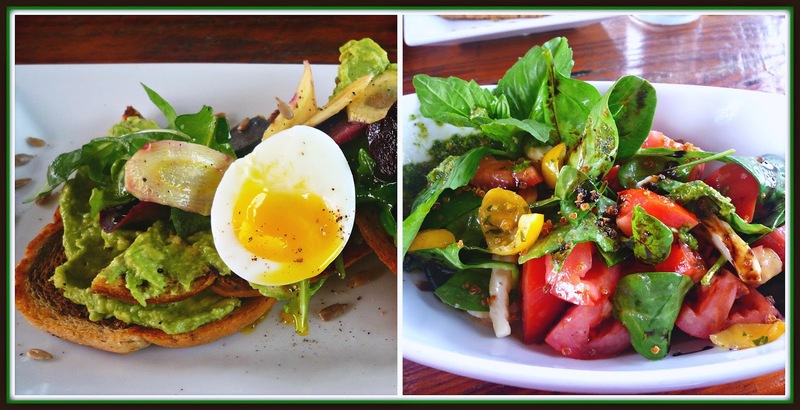 We started with two lighter, veg-friendly menu options: Caprayze Salad and Avocado Toast with Soft Boiled Eggs. Both were perfectly prepared! The Avocado Toast featured creamy avocado spread on toasted rye bread, with shaved carrots, dressed baby greens, and sunflower seeds. The addition of a perfectly cooked soft boiled egg was genius -- the rich runny yolk worked perfectly with the creamy avocado. Grayze's version of Caprayze Salad featured fresh basil, purple onion, and a variety of perfectly ripe tomatoes. It was all tossed in a lovely pesto vinaigrette. Our brunch was off to an amazing start! 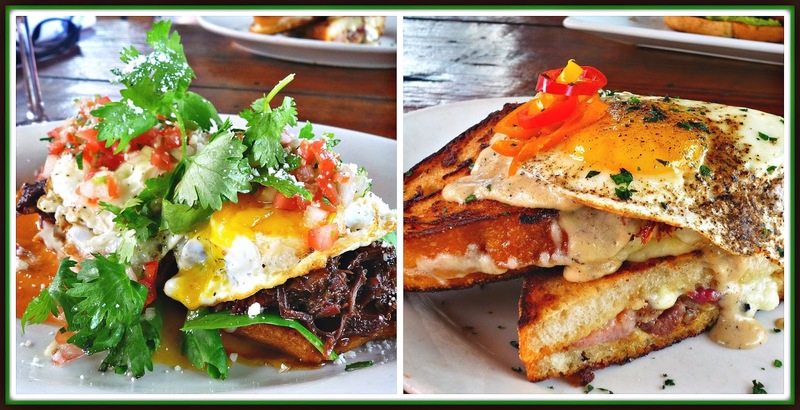 Next up came a duo of heartier main dishes that really showcased Grayze's approach to cooking: Barbacoa Benedict and a Croque Madame. The Barbacoa Benedict featured braised beef cheeks, fried eggs, a spicy scorched red chili hollandaise, spinach, and pico...all on top of a gordita bun. This dish was full of amazing flavors and textures...a Tex-Mex version of a French classic brunch dish. So good!! Likewise, the Croque Madame featured perfectly crispy, buttery bread on the outside, salty ham and melty cheese on the inside...and a perfectly fried egg on top. Helping bring it all together was a slightly spicy cream sauce. This is what I call a "knife and fork" sandwich -- too messy to pick up, but perfect eaten with a knife and fork. The combination of flavors and textures here really worked -- the smoky ham provided the perfect salty pop of flavor that really elevated this sandwich. 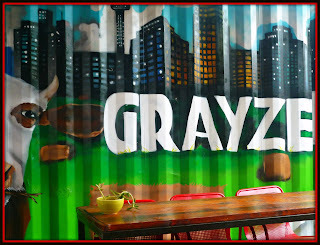 I was very impressed with the Sunday Brunch menu at Grayze! It featured so many creative dishes that it was really difficult to pick just four items to try. I can't wait to go back for brunch after the holiday rush is over to try even more of the brunch menu -- paired with more Anna de Codorníu mimosas, naturally! Grayze offers more than just brunch, by the way. They also offer lunch, dinner, and happy hour menus that feature everything from salads to burgers and sandwiches...and creative craft cocktails to house made ramen. 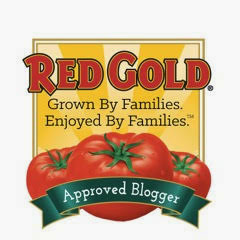 Reservations can be made by visiting the home page of Grayze's website. Disclosure: Anna de Codorníu and Grayze hosted our brunch experience to facilitate this post. All opinions expressed are solely my own.